If you have a Mac you're in luck, because it's very simple to get your photos and videos from your Apple iPhone, iPad, or iPod to your Apple computer. 1. Make sure iPhoto is installed. 2. Connect your device to the computer using your USB charging cord. 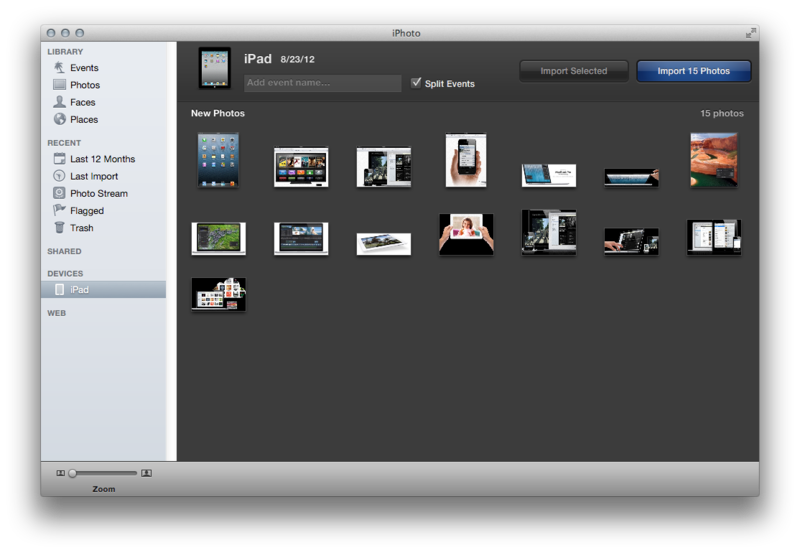 3. iPhoto should automatically open and show all the photos your have on your iDevice in its import window. 4. Click Import All, or if you only want to import certain photos, select the images and videos you like then click the Import Selected button. 5. When the photos are finished importing, you will be given a choice to delete all photos from your Camera Roll. I never choose this option because there are some photos I like to keep on my phone (such as a few photos of my children) to show other people. What I do here is select No and then manually delete photos and videos after I unplug my iPhone. To do this, open Photos > tap Camera Roll > tap Select in the upper right-hand corner > tap on the photos you want to delete from your iDevice > tap the trash can icon in the lower right-hand corner. It is important to delete some or all of the photos on your iDevice to make room for more. If you want a clean slate then choose Delete Photos while your iDevice is connected to your computer. I don't own a Windows computer, but Apple's website offers clear and thorough instructions with photos.